The collegiate fall 7s season has finally come to a close and the clubs are beginning their preseason preparation. As a result this edition of Hail Pelicus will have tournament recaps of all the collegiate action in our Game Reports section. Normal service will resume with our next edition, so if you are refereeing, get your reports in. With that being said, there is no longer an off season for Pelicans so feel free to feed your rugby jones year round. To that end please be sure to update your availability on WhosTheRef so that our assigner Pelicus Fistulator can get referees to all the games and tournaments. It has come to our attention that some of the clubs we provide services for have games scheduled but have not yet contacted the referee society. Our website, pelicanrefs.com details the steps required to secure a referee. Please visit it and complete all steps. As you are aware Scott Wood was our tech guru and responsible for uploading the matches into our referee allocation software. Some of you may have inadvertently sent your match fixture spreadsheet, the template is available on the website, to that Scott’s email address. If you have a completed Match Fixture Spreadsheet completed, kindly resend it to the following email address: fixtures@pelicanrefs.com. That email address is being sent to the new fixture secretary, Neil MacDaonald. Secondly, we are embarking on a new season and clubs may be using different administrative personnel. Kindly review the following page http://pelicanrefs.com/contacts/club-contacts/ and if needed update the information to ensure your club receives timely communication from the society as needed. Thank you to everyone who participated in our NCRRS AGM, especially our coach’s panel. The Flock gathered to run a fitness test, discuss law application and the thought behind it, and pick the winners of the 2019 NCRFU season. Most importantly, we elected a replacement for the sadly departed Our Scott Wood. Congratulations to Lee Bryant (aka “LB2”), who couldn’t make the meeting due to her refereeing a WPL match, but when she received the endorsement of the NCRFU President all pretenders faded away. We look forward to Lee filling her role on the board with the thoughtfulness and passion that she brings to everything in her life. Please note that you can get your entire kit plus accessories EXCEPT for a jersey. Those are still handed out by the society’s Kit Cat because we don’t sell them but give them away in appreciation of refereeing 5 assigned matches. The store is currently open and will be available until midnight, Sunday November 11, so any purchases made should arrive in time for the holidays. Try to remember that date as all orders need to be in by then to be processed. If only there was some way to ensure remembrance of that date. Oh well, as a veteran of many online stores I am sure I will come up with something. While the rest of our great 49 states are fully engaged in 15s rugby, Norcal continues its trend of being special and hosting the final weekend of the annual West Coast 7s on The Treasure Island at the famed San Francisco Golden Gate Rugby Club. This two day tournament was officiated by four southern California brethern, and three locals. The first of many partnerships proved fruitful as I were introduced to Matt “Uncle” Rico and Alexis the opera singer. It was well attended by schools. The usual suspects entered the tournament, from powerhouses like Cal, Arizona, UCLA, we saw some newcomers like Cuesta College make a strong showing. As usual, SFGG is a great host, and Pete Smith thoroughly enjoyed himself on the microphone. Full of quips like Fenaroli wearing small powerlifting shirts, to putting on a great playlist both days- the guy was on fire! Newly minted FLORUGBY carried the video of the matches and they did a great job of covering the action from start to finish. Uncle Rico loved his sweet red matching tracksuit so much that he wore it all weekend just so he would have the strength to throw a football over the mountains. There was some superb coaching provided by none other than Paul Bretz. We thank you for the feedback and constructive criticism to help the game grow. Day one had a host of injuries with one referee complete decimating University of San Diego’s roster and leaving bodies along a trail leading to Oakland hospitals. Once Cal got by Arizona, and UCLA did the same versus Cal Poly, it was an all California final, featuring THE university of California and The one from South of the Grapevine. The weekend was capped off with what was meant to be a BBQ competition featuring the likes of USA Eagle Todd Clever, but due to copyright issues, Clever was told he would have to take his pulled pork elsewhere. The San Jose Rugby Foundation had a monopoly on the weekend and even had a respectable 50/50 raffle that awarded more than chicken bones. So we will get 15s, until then we enjoy counting down from 7, and doing less math when it comes to numbering players on the field. 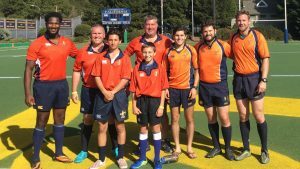 CSUMB hosted the West Coast Qualifier for the right to represent at the NSCRO National Championship. The field was in great shape and clearly marked and the teams were all ready to compete for the title. A special thank you to CSUMB for providing water and snacks to the teams and the referees all day – a fantastically organized event. Teams included Humboldt St, CSUMB and a couple of motley sides. Of course, the participants from last year’s epic final, Cal Maritime and Claremont Colleges, were present with a wary eye on each other. The day proved to be perfect for rugby as Monterey showed off why it is a world class destination. The teams were playing hard and fair – I do not recall any cards for foul play – and the games were fast. As the day progressed it became increasingly obvious that a finals rematch was on the cards as Cal Maritime and Claremont Colleges separated themselves from the pack. Last year Cal Maritime prevailed in a thriller with a try at full time to Claremont and a simple conversion to tie and send the match into overtime, but the conversion was missed. That is why we play the game – nothing can be taken for granted. Claremont clearly wanted revenge for their loss last year and came out on fire in the final. As good as Coach Steve Hyatt’s Keelhaulers were, they had no answer to the relentless attack and stifling defense of the southerners and the final ended up with a lob-sided score of 31-0. That did not tell how evenly matched these teams were, but was an indication of how lethal Claremont was once they sniffed the try line. Good luck to Claremont Colleges as they seek to add to their 15s national championship earned back in June. This is a solid program that has put together quite a run. A great job was done by the refereeing crew of Neil MacDonald, Jordan Bruno and James Hinkin with congratulations going to Roberto Santiago for earning the whistle for the final. Also of note was the tireless efforts of young Gregor MacDonald who ran touch all day without in the least looking like he was tired. Ah, to be young again. The Pac West 7’s were held on campus of Fresno State on their Kinesiology field. It was true regulation with well-defined lines and phenomenal grass. Pac West Commissioner James Fonda and his liaison at Fresno State, Mike Darling, definitely set up a great arena for rugby. 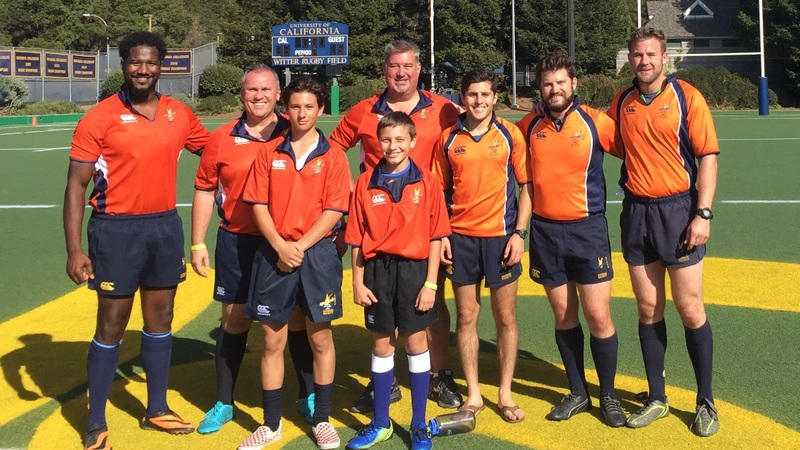 The Pac West teams included UC Santa Barbara in the tournament, and as with the teams, our referee group was a combination of NorCal and SoCal referees. Austin Reed and Alexis Alfaro joined Rod Tuisavalalo, Andrew Arballo and Dan Wilson for what Austin described as the most stress free tournament he had been to all season. Additionally, 7 ARs from the local area joined to run the lines. Yep, it was set to be a good rugby day, but then again, isn’t every day? The competition on the pitch could be described as competitive, with only one pool-play game being lopsided. In the two brackets, Stanford clearly was dominant on one side and both Fresno State and UN Reno were the lead teams on the other. That side’s final pool play game was against each other with Fresno State coming out on top at the end, but it could have gone the other way easily. Most of the other games were more evenly matched even with certain teams not winning their games yet still being in each game until the end. Overall, the games were played with great sport. It was rare that a card was pulled demonstrating both fair play and effective referee control and management. The one stoppage for injury was even not due to foul play. From the referee aspect, the scheduled rotation worked well and the collaboration between NorCal and SoCal went on to include sharing of concepts being taught. We all enjoyed the day. The final game demonstrated Stanford was above the rest of the teams in both talent and strategy. Stanford focused on Fresno State’s one weapon, Isiah and was able to dominate the game by not allowing him to shine. Meanwhile, Stanford’s teamwork and athleticism was on display with emphasis. Fresno State star, Kruse, was able to dot down a try in the final minute to ensure it they were not shut out, but the game was really decided in the first two minutes. Congrats Stanford. Thank you, also, to the Fresno Men’s Club for hosting a family social at a park on Fresno State’s campus which allowed both Austin and Alexis to have a social and meal before getting back on the road to the land down south. First and foremost, I want to thank everyone at the University of California from Coaches Clark and Billups to the non-rugby Cal students working the concessions stands for putting on the first-class event you would expect from one of the finest Universities in the world. Special shout out to Mike MacDonald for running the operational aspects of the event. Clearly a huge job that Coach MacDonald made look easy. Congratulations to Cal for winning the tournament. Consider that at the coin toss the options are to kick or pick an end (which means receive as well). The thought behind that is kicking off has the same benefit as putting the ball in the scum or throwing at a lineout. You should retain 80-90% of your kickoffs and Cal was absolutely dominant in this area. They put on a clinic on why you choose to kickoff. In a typical 7’s match, you will have 2-3 scrums (with short advantages) and 1-2 lineouts (almost no kicking and teams work to stay inbounds) so the set piece that occurs by far the most is kickoffs. Moreover, kickoffs are momentum opportunities. You are either starting a game/half or you have either just scored or been scored on, so the kickoffs are critical. Cal performed well in all aspects but excelled at kickoffs and major point of separation between them and the competition. Stanford deserves recognition for this event as well. It wasn’t that long ago that they were being criticized for cancelling their game against Cal. Stanford showed up with their B side because their top team was in Fresno winning the Pac Western 7’s (the league they actually compete in). They played hard, competed in every game, took their lumps, didn’t complain and showed that their program is on the rise again. Oregon St likewise deserves some recognition for making the long trip and being competitive. They were 2-2 heading into the 5th place game against USC. USC has Michael Cesar and he is a scoring machine that is hard for anyone to stop and he was the difference in USC taking 5th. I can’t believe I just typed that either- USC 5th (and not last)…it shows how far has that program come in the past few years. I’d like to recognize 16year old Cole Wallin for doing a great job as an AR all weekend. He performed at a level of maturity well beyond his years and is primed to follow in Andrew Stockton’s path to success. He was given the whistle for the 7th/8th place game between Utah and Stanford and to quote Hall of Fame Coach Billups who went well out of his way to let Cole know “he outperformed the players”. I let Cole know of the assignment only 20 minutes before kickoff as I didn’t want him to have time to be nervous doing his first (and definitely not his last) match on National Television. There was a play late in the second half of Cole’s game where there was a clear not releasing penalty, Cole let it breath to see if the non-offending team could gain advantage once the ball was released and that decision resulted in a try. High level stuff from a ref of any age. Well done Cole!! Continuing the youth topic, I would like to thank Allen Gray and his 12-year-old son Peter for coming out on Sunday to complete the team of 5 for the final round. Allen and Peter both performed at the high level we expect from our AR’s here in Pelican Land. Peter has no fear and the moment never seemed too big for him. In fact, he was chomping at the bit the take a whistle on the field…already Cole has to look over his shoulder at who is coming up behind him! I look forward to Allen’s contribution to the Society and watching Peter develop. A referee issue occurred in the first semi-final match that bears some discussion. Once we realized that the delays caused by television allowed us the time to use radios, we put them to use on Sunday. There was a play late in the game with the score 17-12 where the UCLA player dropped a pass and the ref was slightly unsighted, but the pass appeared to go backwards. The AR radioed in that a knock on had occurred, the ref asked if he was certain and the response was ‘yes’. The referee blew the whistle-game over. Needless to say, the ball went backwards. First off, you can’t un-blow the whistle. It only took a few moments to realize the AR made a mistake, unfortunately the law doesn’t allow for correcting that mistake. When questioned by the media the referee correctly stated that we are a team and he needed to trust his team. They let him down in this instance, but the thought process was correct. Like players, a team of refs need to operate as a team and we need to trust each other. Like players, we make mistakes that cost the team. Both the referee and myself apologized to the UCLA coach for the mistake. Nothing more we could do. Lessons learned. The Pac 12 Sunday Referee Crew. (Matt Hetterman not pictured as he was only available Saturday). This entry was posted in News on November 8, 2018 by James Hinkin.